Back in the home they shared, surrounded by reminders of Logan and his young daughter, Claire begins to realize how much she misses the family she almost had. 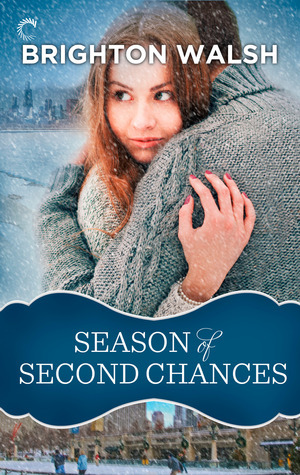 After a few cups of Christmas cheer, she falls right back into her ex's arms-even though she knows it means setting herself up for heartbreak all over again. There's something so inviting about reading a holiday romance that centers around two characters who share a heated past. Claire and Logan were on the path to marriage, or what should have been their happily ever after. But when Logan began to put his work before Claire the tension in their relationship started to divide the two of them. This story begins a few years later, after Claire made the hardest decision to call off the engagement and leave Logan behind. She's stranded in the Chicago airport during a winter storm on Christmas Eve, and with all the hotels booked up, her only option is standing right in front of her: Logan. The awkwardness of the situation felt very real from the beginning. What should have been two adults sharing a space for the night quickly turns into an evening of heated passion that refuses to burn out, no matter how much time they've spent a part. Immediately Claire's heart is on her sleeve, remembering how good and how right it felt to be with Logan. She begins to see the changes he's made since their departure though. It's very obvious in the relationship he has with his daughter. Since the snow storm keeps Claire grounded in Chicago for longer than just a night, she's placed back into Logan's world, seeing his life as it is today. What should have just been a night of forgotten passion lingers into the daylight hours where both characters are forced to see the truth of what's never left between them. Even though this story was short in length, it still packed a powerful, emotional punch. As the reader, I felt invested in their story and compelled to see it through to the end. Spend a Christmas in Chicago with these two characters who may seem broken, but when put back together complete a picture vibrant with so many shades of color and romance. I'm such a sucker for holiday novellas. I just love reading them. I will for sure be putting this one on my list. I like second chance love stories. This has been on my wishlist for awhile. You highlighting it reminds me I still need to read it.